Chapter 7 is honored to invite you to attend our annual Distinguished Service Awards Luncheon. Seminole County Sheriff Dennis M. Lemma will be our guest speaker. 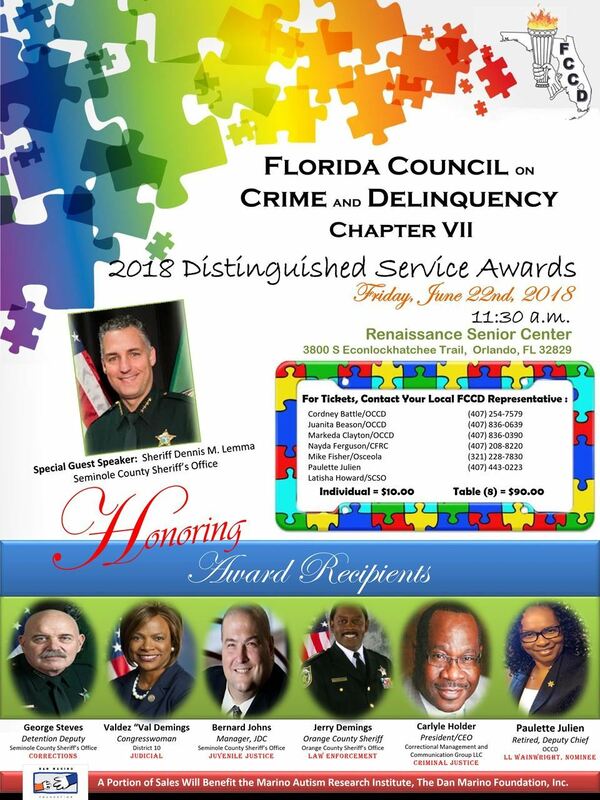 Award Recipients include Congresswoman Valdez Demings, Sheriff Jerry Demings, Detention Deputy George Steves, Manager Bernard Johns and Retired Deputy Chief Paulette Julien. Tickets are $10 or $90 for a reserved table of (8). Luncheon includes your choice of grilled flank steak, chicken piccata or vegetable lasagna, salad, wild rice and quinoa pilaf, red velvet cake & New York style cheese cake. Please contact one of following Chapter 7 representatives to purchase your tickets today. Tickets sales end Wednesday, June 20th.